The Hosta of the year for 2016 is Hosta Curley Fries. In 2008 breeder Bob Solberg introduced this magnificent Hosta. Its curly chartreuse leaves form a diminutive mound of about 6” high and 16’ high giving it an unmistakable appearance. 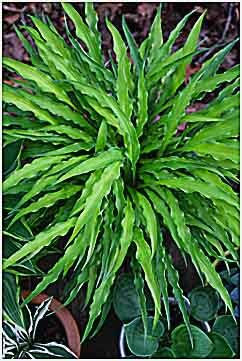 It was from a seedling of Hosta Pineapple Upsidedown Cake. The best color comes from growing it in an area that has morning sun with afternoon shade. This is the most distinctive hosta to be introduced in some time with its highly ruffled narrow leaves that emerge yellow and then fade to near white. In midsummer deep purple scapes emerge on top of the plant with lavender flowers. Its size and color make it a great plant to grow in a container by its self or with others to make a great color contrast. In the garden it has great diversity as well; it can be grown in lines or in clumps to insert its stupendous color to an otherwise dull spot in your garden. This Hosta Curley Fries has all that it takes to be a winner, Hosta of the Year 2016. It is one of the many Hostas that have been introduced by Bob Solberg. Congratulations to you Bob, and I will add more of your Hostas to my blog.